It started quite innocently, as these social media collisions always do. A friend and I were discussing on Twitter Ed Whelan’s bizarre conspiracy theory in defence of Supreme Court nominee Brett Kavanaugh, remarking – as many people have – that it was reminiscent of Eric Garland’s infamous 120-tweet long ‘game theory’ thread of late 2016. 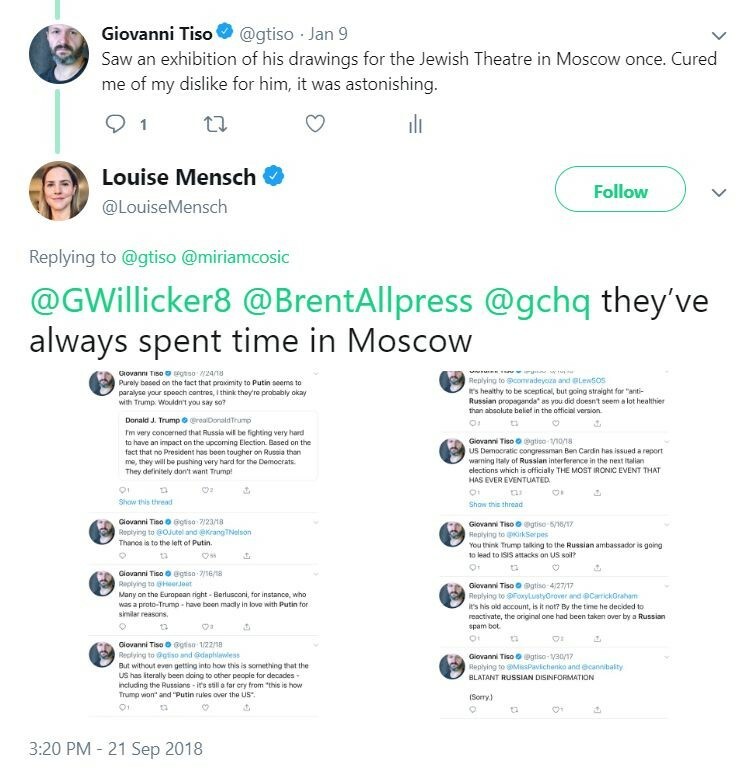 A random Twitter user (you must always watch out for those) chimed in that not just Garland but also former Tory MP Louise Mensch had been vindicated by recent developments in the Russia investigation. I responded that someone who has claimed that Bernie Sanders is a Russian asset and that Vladimir Putin is orchestrating both the #metoo movement and Black Lives Matter will never quite be ‘vindicated’. 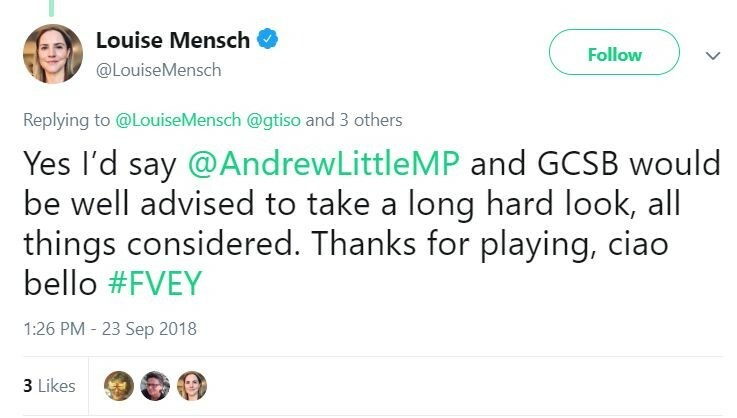 This must have triggered Mensch’s activation code. However, instead of engaging with the thread, Mensch searched my Twitter history for a few key words. Then, over the course of the next twenty minutes or so, she produced a febrile series of tweets in an apparent effort to ‘flag me up’ as a Russian spy. This reaction initially confused me because she was not making her claim to her large Twitter following (roughly 279k). She was, rather, replying directly to various old tweets of mine that she regarded as incriminating. It was a more intimate accusation of wrongdoing than I might have expected – almost a whisper campaign for my ears only, and those of various authorities. It’s worth reproducing some of the tweets. The first one was addressed to me and one Brent Allpress. This is the detail of some of the tweets that ‘expose me’. It seems that using the word ‘Russian’ is incriminating. Having been to Russia is also evidence. Making a joke about spies also means you’re a spy. 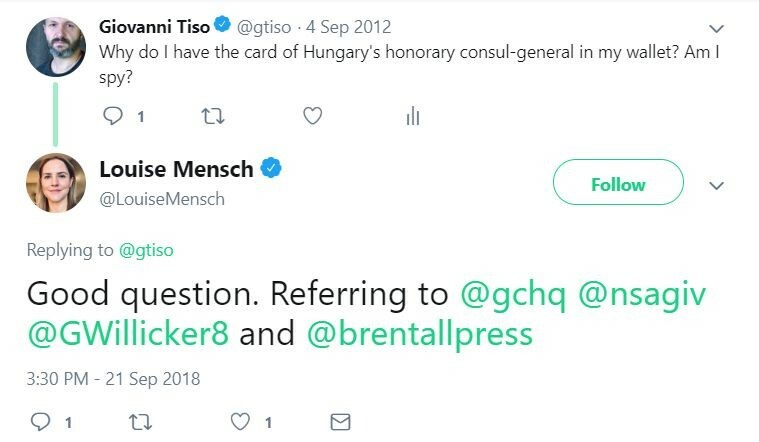 This time, Mensch helpfully refers me to the British intelligence service and the NSA. 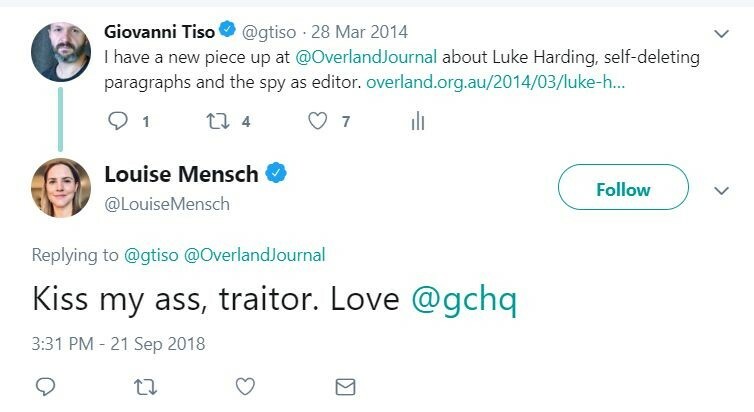 This one calls me a traitor for having penned an Overland article about Luke Harding. Traitor to whom, is not terribly clear. GCHQ is copied in again. 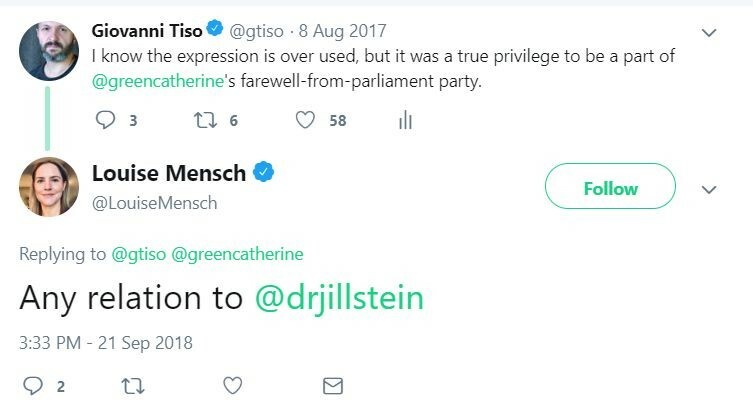 This one – in which Mensch tries to link wonderful former New Zealand Green MP Catherine Delahunty to US presidential candidate Jill Stein for reasons best known to her – is quite intriguing: how did she find it? What was the search term? 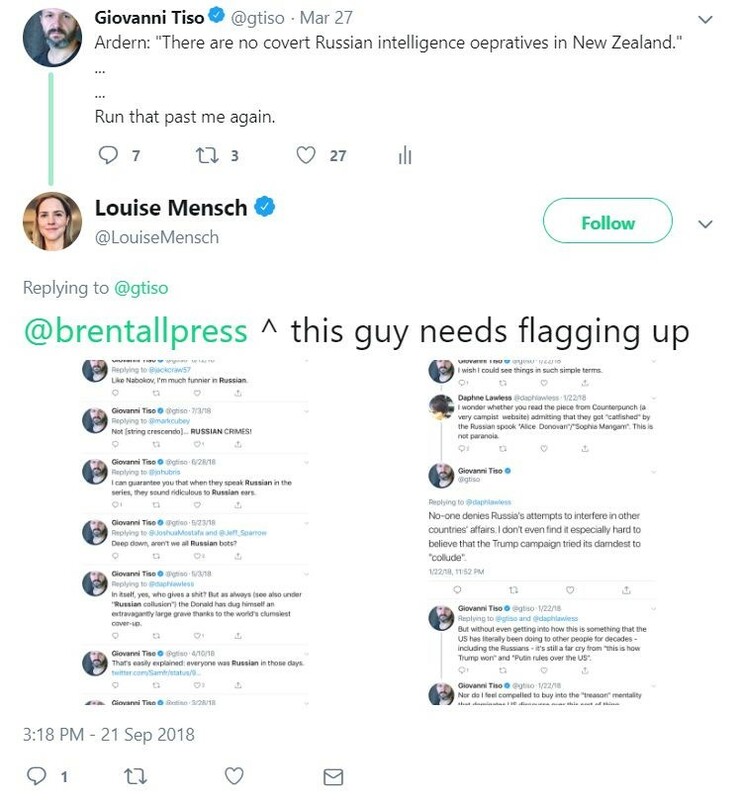 The last tweet in this first furious salvo (which I have reproduced only in part) clarifies Mensch’s apparent intent: to flag me with the New Zealand intelligence services. She might have even thought that her job was done. Note the distinctly McCarthyist flavour of the exchange. 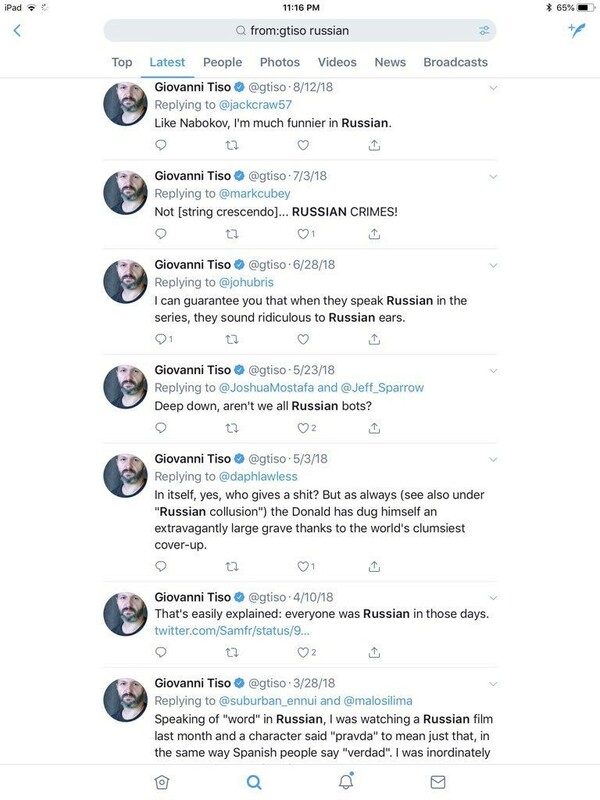 None of the tweets that Mensch found is evidence of anything other than knowledge that Russia exists. Together, in her mind but possibly also in the social context in which she operates, they may constitute ground for suspicion of a kind. Writing about Mensch for Vox, Zack Beauchamp has described her as belonging to the ‘Russiasphere’, an informal media network that operates mainly through Twitter for the purpose of advancing not a unified conspiracy theory but rather ‘the general sense that Russian influence in the United States is pervasive and undercovered by the mainstream media’. 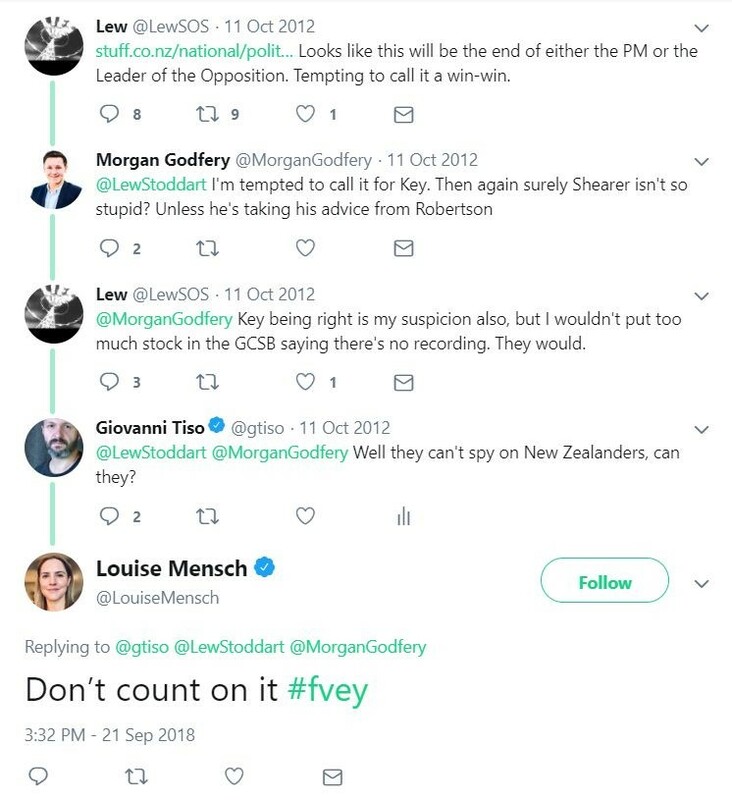 Evidently frustrated with not being able to find a Twitter address for the New Zealand Government Communications Security Bureau, Mensch settled for alerting the Minister of Justice in charge of it. And because Mr Little is a minister, there will be someone in government who has to file the request along with the tweets from the dozens of users that made fun of it, adding to the general absurdity of the exercise. This story is 95% ridiculous, but it’s also 5% serious. ‘Reporting’ people to the intelligence services for pointing out on Twitter that you said some stupid things in the past is not a normal thing to do, although it has become normalcy adjacent. The pervasiveness of conspiracism in the global political discourse, combined with the attrition-free nature of social media (leading to what I called in the past the unbearable closeness of others), is a breeding ground for a new culture of suspicion from which no country or community is quite immune. 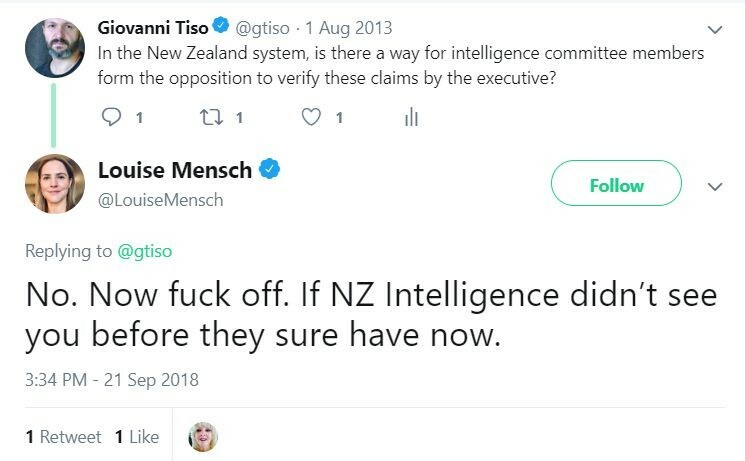 Where Mensch erred is by not knowing in what language to frame her claims in a New Zealand context. Were I more socially isolated, or in possession of less cultural capital, I might be vulnerable even to a clumsily worded attack such as this. If I lived elsewhere, it might have actual repercussions on my freedom or employment. It’s not altogether a laughing matter. But for the most part it is, and if we can’t have a bit of fun while the world goes down in flames, then what can we do? Wow this is amazing Comrade Tiso! I had no idea you were so influential in the world of international espionage. Paranoia is always a distinguishing characteristic of the extreme right, but Mensch’s seems to operate at an extraordinary degree. 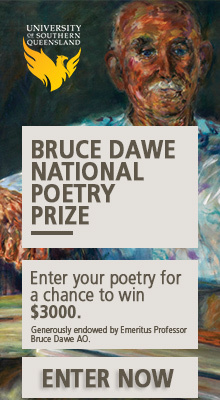 Apart from having the time and energy to pick on (and I say this with the greatest respect) an obscure writer in Aotearoa, the level of personal bile is quite something. That’s the creepiest part really – not that she referred to you to NZ GCSB (that’s weird and scary enough) but that, as you say, she began a kind of ‘whisper campaign for your ears only’. Anyway, thanks for enlivening and entertaining lunchtime reading. I hope you passed through your Mensch-ian encounter intact, and are not too freaked out by it all. отлично сработано, Gio. It’s not often I actually really do laugh out loud, but the penultimate Tweet you shared just slayed me. I truly can’t work out whether she’s very stupid or very calculating – or perhaps she’s both. Either way, she’s the worst spy hunter ever. This’d make a great film satire – To Russia With Kid Tweets? 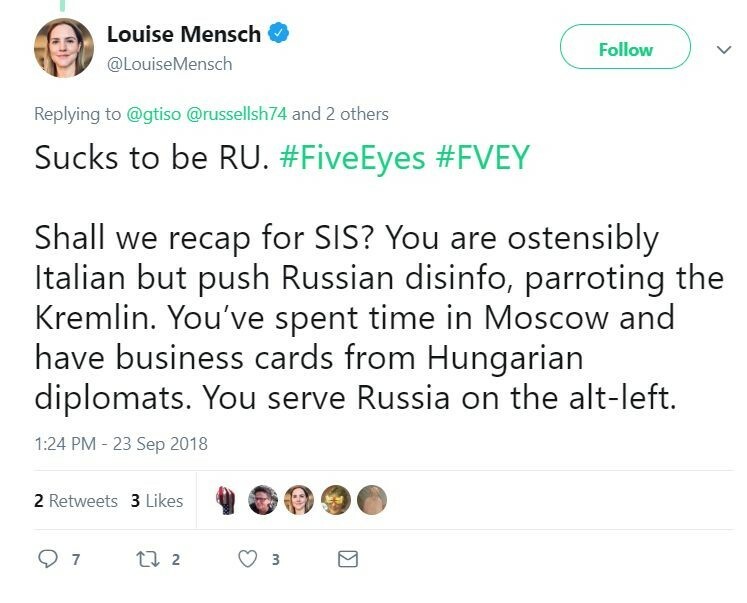 You did say Russia quite a bit …but srsly I think Mensch is ill, I followed her for a bit awhile back & even though I thought she had it wrong worth listening too maybe?? but at some point her mind seems to have snapped even if u account for the interests of possible pay masters. If the readers are unaware if she is paranoid or stupid, I must introduce you to her nemesis – Tim Fenton. There are years of fun to be had searching that blog about the Mensch.